Here's an image I drew while contemplating returning to Taiwan. I taught English in Taichung and Tainan, Taiwan from 2004-2006. I enjoyed it overall. It's a friendly little island with some beautiful spots in the center and on the east coast. One of the downers though for me was the pollution from scooters. There are literally millions of scooters. Around 23 million people live in Taiwan. And most people drive scooters. And most of those are packed into one third of the island which can make for some pretty dirty air and a noisy environment. I'd say Taiwan is a pretty livable place subtract the scooters. On the other hand a scooter is fun and you'll most likely have one if you're outside of Taipei. You can get around really easy on them, they're convenient and filling a tank on one of those is really cheap. So if you are going to get a scooter get a four stroke, they don't pollute as much and usually aren't as noisy as a 2 stroke. 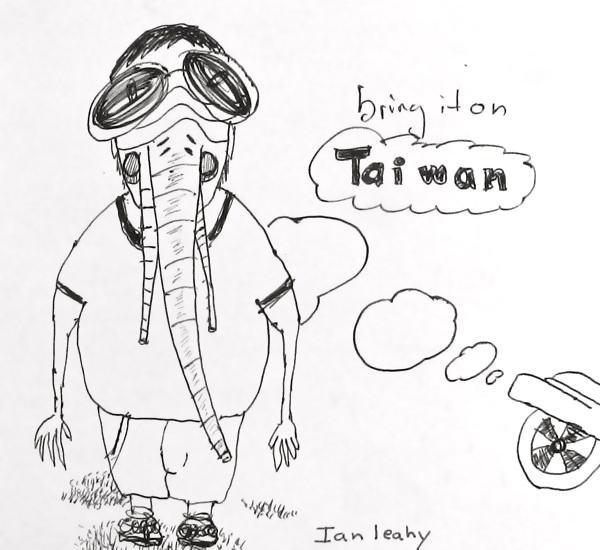 Anyways in 2009 I went back to Taiwan to check it out as I was considering moving back there and I drew this picture. People do wear cloth masks there to protect themselves from exhaust yet not quit like this one.